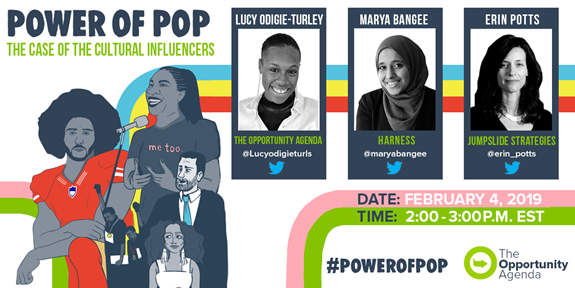 Join us on Monday, Feb. 4 at 2 p.m. EST, for a discussion on findings from our latest research, “Power of POP: The Case of the Cultural Influencer.” In recent years, the power of popular entertainment to inspire large audiences and shift cultural norms has become a topic of growing interest in the social advocacy space. As part of our Power of POP series, this new research examines three cases of high-profile entertainers and athletes speaking out or advocating for a social and/or policy change. During the webinar, we will discuss key findings from our analysis of Colin Kaepernick and the Take a Knee protest, as well as practical recommendations for those seeking to work directly or indirectly with cultural influencers to shift narratives. We will also hear from guest speakers Marya Bangee, Executive Director of Harness, and Erin Potts, Senior Fellow for Pop Culture Collab, who will talk about their work at the intersection of culture, entertainment and social change. Sign up to receive free tools on immigration, economic opportunity, and criminal justice issues!